Happy October! It’s officially pumpkin season so no need to hide your love of all things orange any longer! Go ahead and sip on endless pumpkin spiced lattes — nobody will judge you. Eat an extra piece of candy — the neighborhood kids won’t notice. Make a Halloween inspired cocktail and hit up a local pumpkin patch to pick out the most perfect carving pumpkin out there. Halloween season is here — rejoice! If you’ve been considering to throw your very own Halloween party — this is your year. You’ve got just the right amount of time to put your plans together, send out some invites and get your party goodies together. Still racking your brain for some fun Halloween party ideas you can use? We got you. 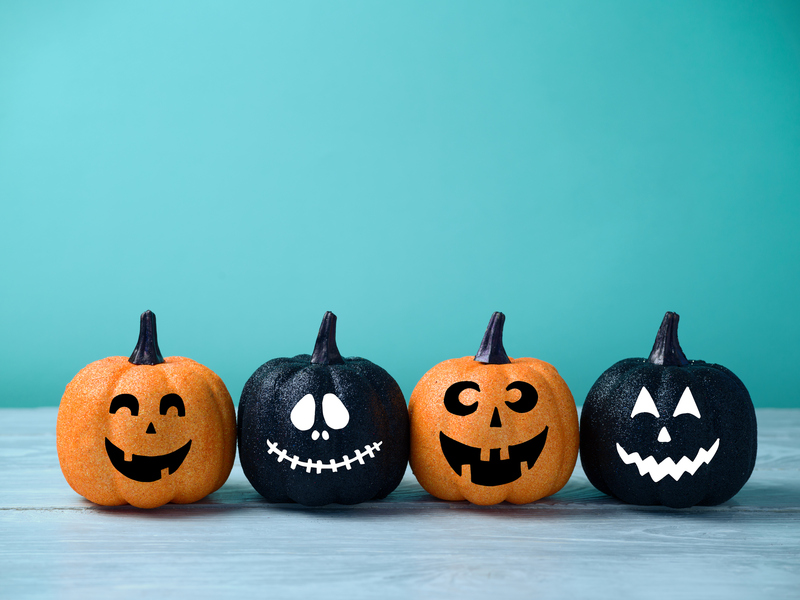 We’ve scoured the wonderful world of Pinterest to bring you some insanely awesome Halloween party ideas that you’ll be able to recreate with ease. Using candy as the theme for your Halloween party may seem a bit overdone, but that couldn’t be farther from the truth. It’s impossible to over do the candy theme. It’s Halloween! 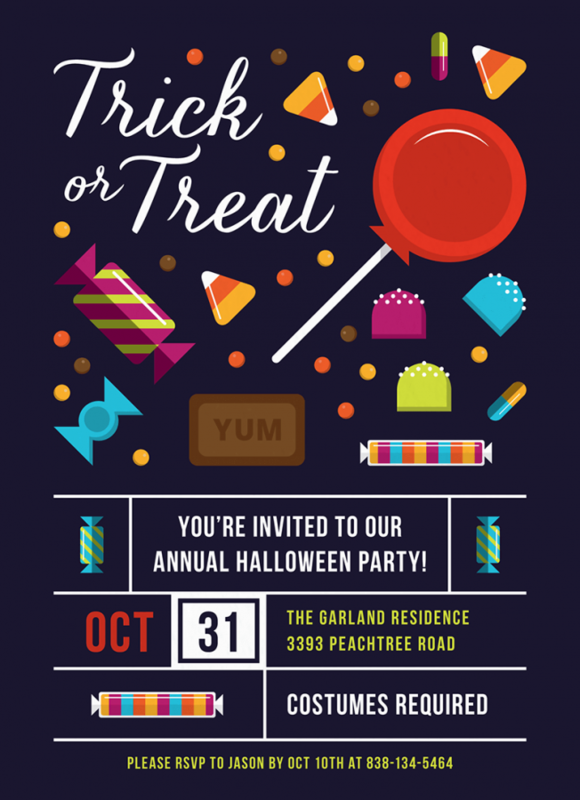 This fun Trick of Treat candy Halloween party invitation is both fun to look at (we love how the colors totally pop right off the invite), sets the whole candy theme and still gives all the important party information without muddling it all up. Win. Win. Win. So to keep the candy theme going, how about adding a candy-esque bar to your shin dig? Your options are limitless — get as creative or as simple as you’d like. Even include a giant Halloween cake to the center if you wish — or don’t — whatever works for you. Get creative with your candy goodies or simple fill up a bunch of pitchers with different types of candy. And voila! Who ever thought that a Halloween party could be chic?! We do. Not all Halloween parties have to be a scare house filled with gore and candy wrappers — although there’s nothing wrong with that either. 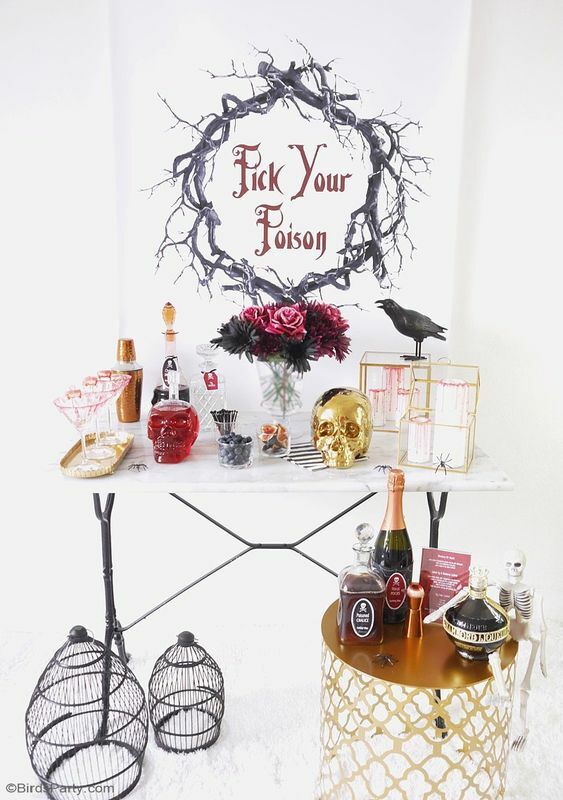 You can totally throw a classy chic inspired Halloween party without any issue. 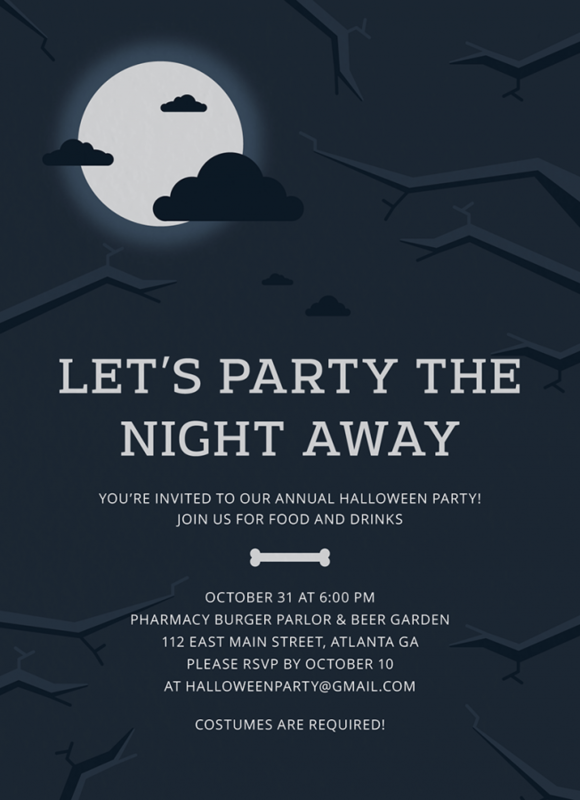 This dark blue — almost charcoal — night time Halloween party invite is the perfect start to setting the theme. It’s simple, but still has a Halloween-esque feel to it. The creepy crawlers are a Halloween favorite. If you’re not totally against the idea, this theme is super versatile and easy to incorporate into everything from the decor to the food and invites. 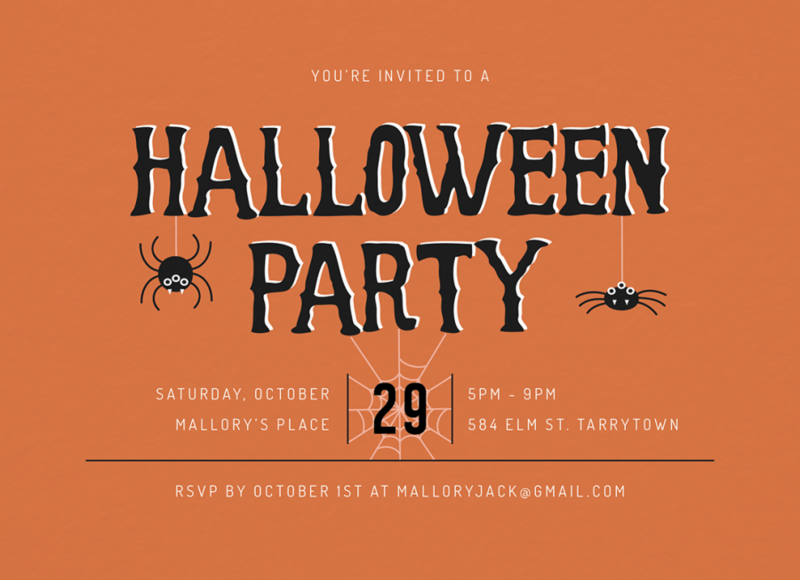 This simple and fun orange Halloween party invite is perfect if you’d like to start incorporating the spider theme early on. It’s not overwhelming, but still adds a little something. The spider cake. Like we said, using the spider theme is super easy. 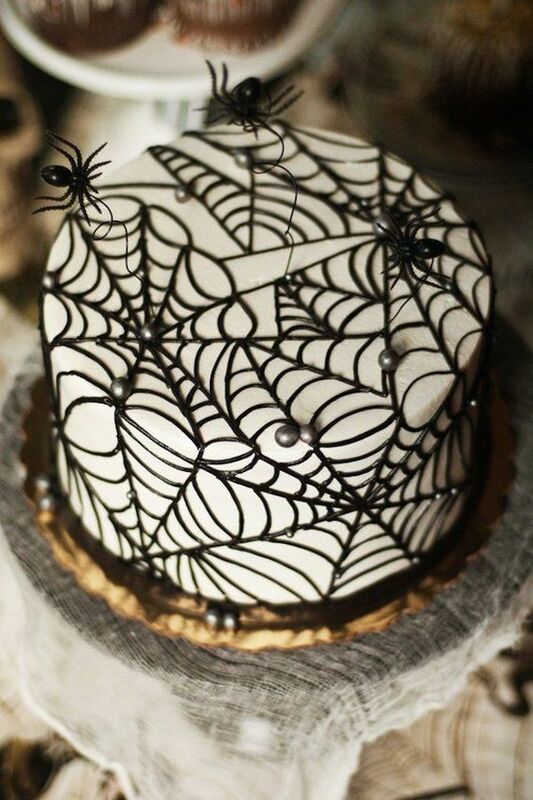 We love this black spider webbed around the white cake! Add a few plastic spiders and you’ve got yourself a stellar masterpiece for your Halloween party. While you may tell your little ones there are no monsters in the closet, perhaps you’ll still want to use them as the theme of your big Halloween party. This theme is also incredibly versatile. 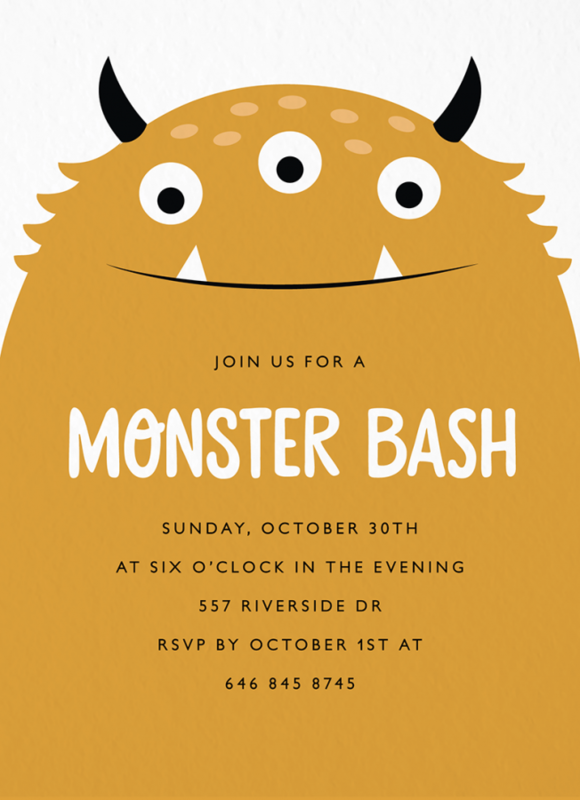 This adorable Monster Halloween party invite will be the talk of the party. Your guests will be sending their RSVPs all at once. Just look at how cute this illustration is! While some monsters can be scary — this one is too cute to refuse. Want a super easy way to incorporate the Monster theme into your Halloween party? 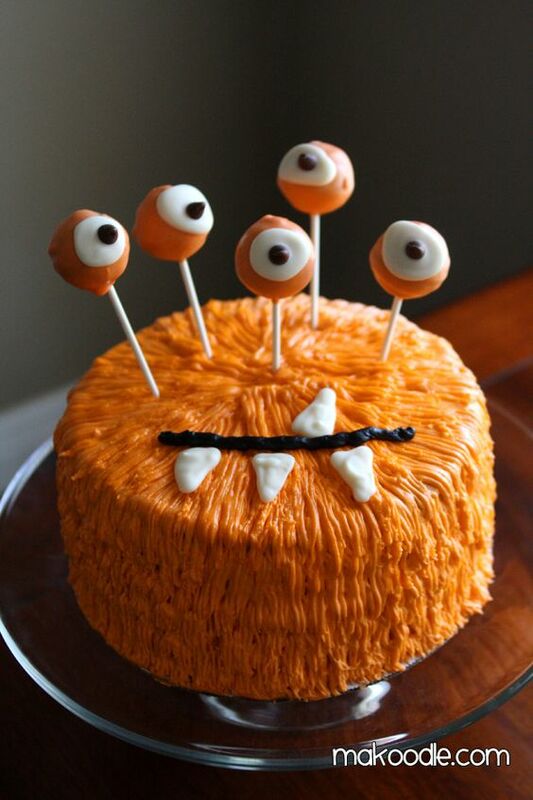 Add small cake pops as the cake toppers and turn your plain orange cake into the monster centerpiece. Voila! It’s hard to imagine a Halloween party without at least one person getting dressed up as the good ole’ classic ghost. Why not use this as the main theme to your Halloween shin dig? 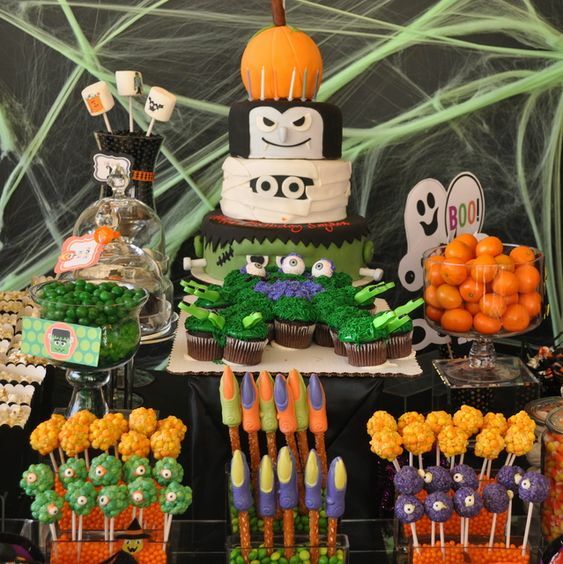 This fun Boo Halloween party is both cute — just look at that BOO — and simple all at once. Want a classy way to add a little ghost-like spirits into your decor? 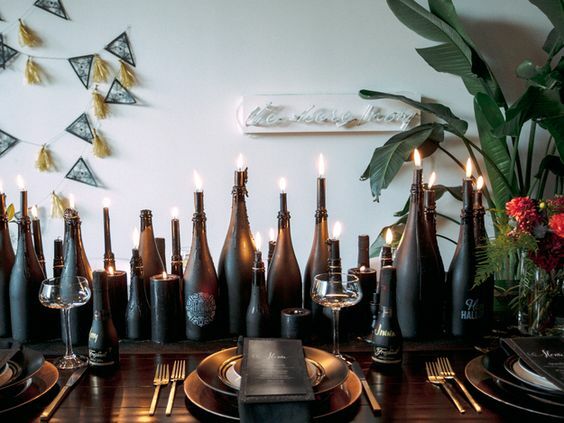 Paint old wine bottles all black and use them as candle holders. The flames look like tiny little ghosts and the lights add a bit pf pizazz to your party. Didn’t think we’d skip over the pumpkin? How could we ever do that!?! Everybody loves a big orange pumpkin! 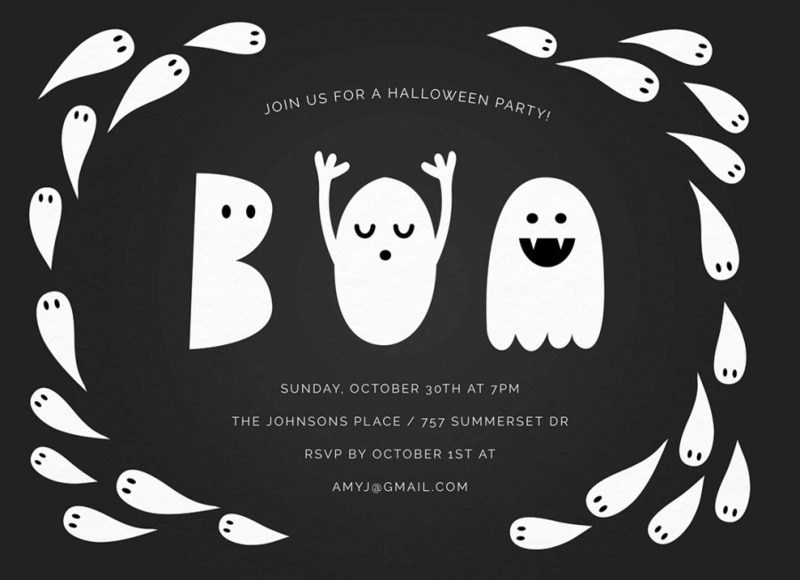 This ghost pumpkin Halloween invite includes the best of both worlds — the pumpkin AND the ghost. Whoa. It’s like the best of both worlds collided. 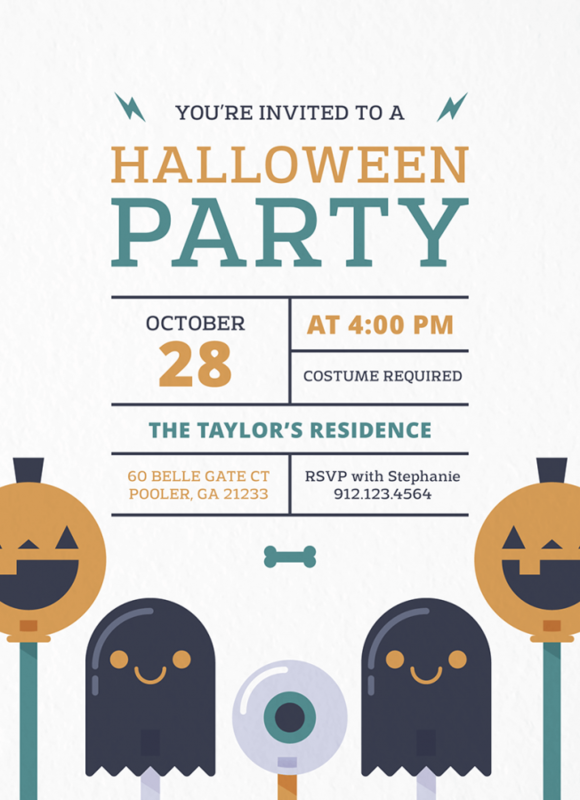 We love the simplicity of the design so that the party information is easy to read. 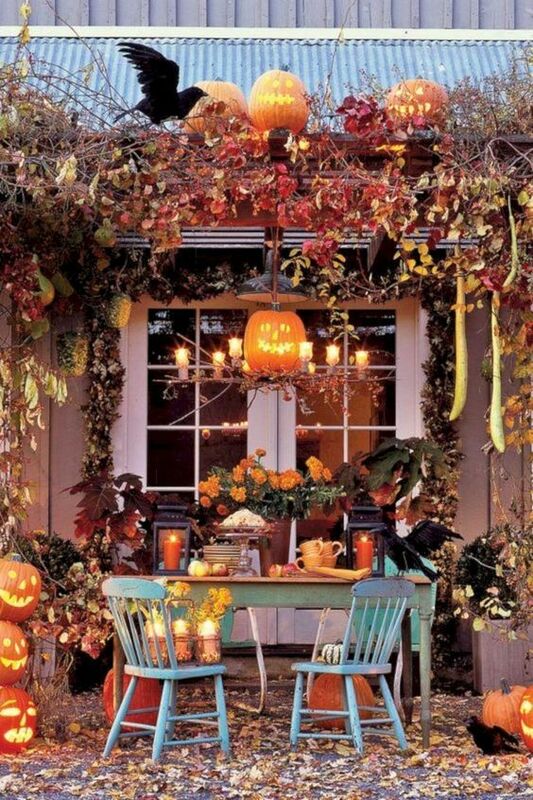 If you were wondering what the ultimate outdoor Halloween decor looked like — this is it. We love the over the top fall leaves matched with all the pumpkins! Everyone loves a good witch! And probably a few bad ones too. This theme can be really fun to play with when it comes to the food and drinks. 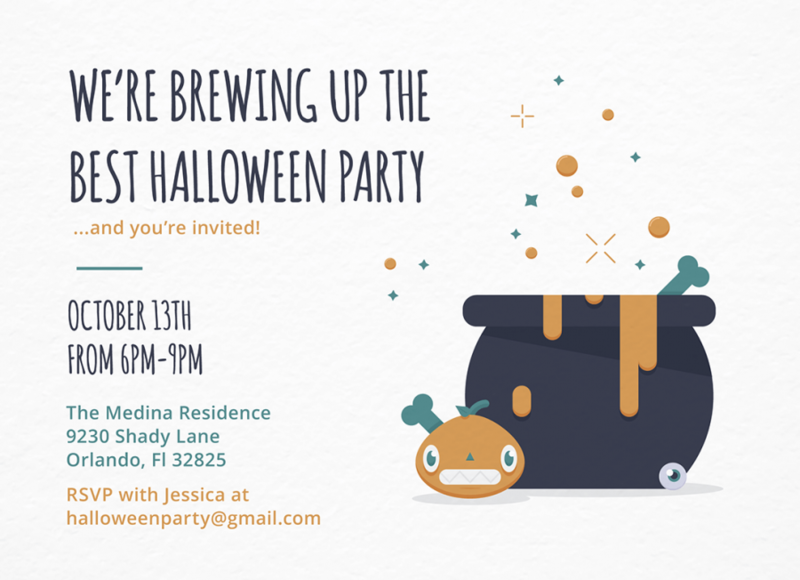 This trendy Halloween witches brew party invite is the perfect combination of adorable illustration with a fun font and simple design. Didn’t we say you could have fun with the cocktails?! 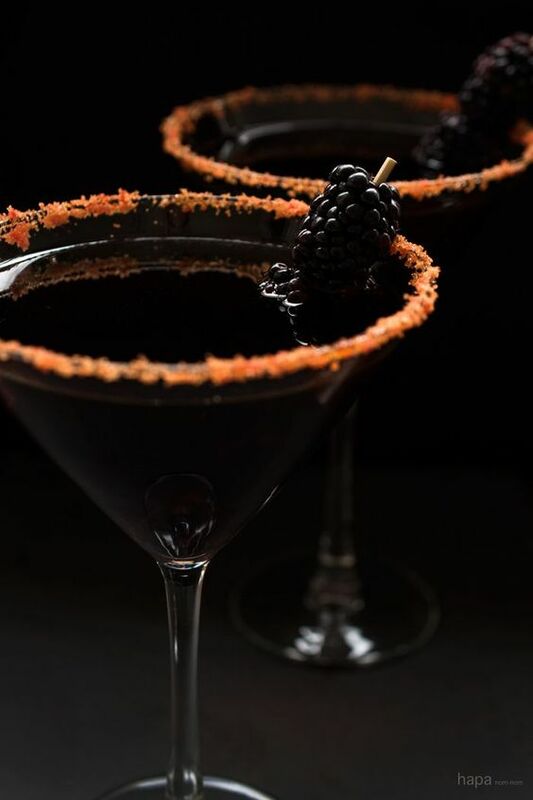 A black Devil Martini sounds pretty darn bewitching (get it?). The green machine man is a classic and totally underrated. It’s also super fun to play with when it comes to theming a Halloween party. 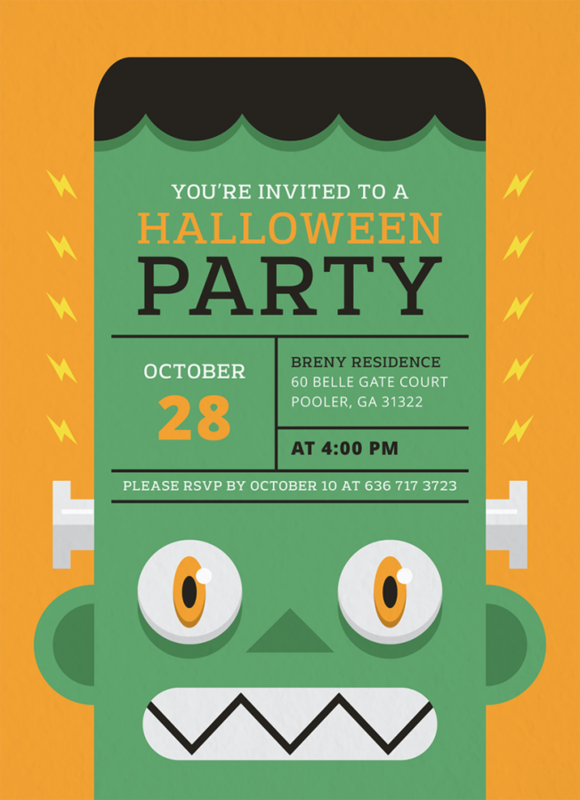 How fun is this bright Frankenstein Halloween party invite?! It’s hard to look away and definitely sets the tone for your festivities. 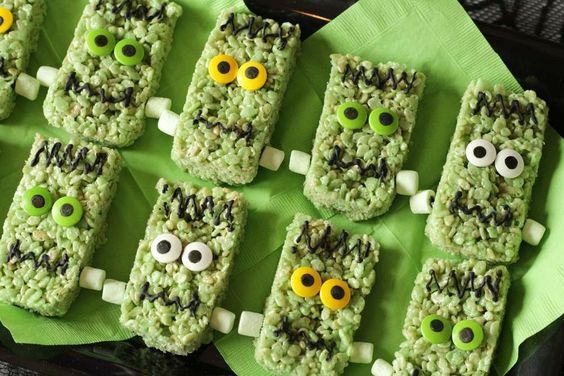 Franken-rice-crispies? Can we even do that? These adorable little sweet treats are a great way to incorporate the theme and enjoy a little extra sweetness. Now it’s time to open the door to all the witches and goblins and devils and whatever else your friends want to dress up in… And host your very own Halloween party. What fun idea will you choose?